Mrs. OrDie made me promise to get this fast and easy recipe for an exciting two pan dinner up on the blog. So, here it is. Mix the rub ingredients together and pre-heat the oven to 425 degrees. In a skillet (something that will take fond), add a little olive oil and then add your rinsed and dried chicken (anything from a game hen to a roaster will do, just make more rug and extend cooking time as the bird gets bigger). Sprinkle some of the rub inside the bird. You may want to add a little extra salt, but use care. We'll be making a pan sauce with the juices. Place the bird breast side down and add a little olive oil, rubbing into the skin. Sprinkle more of the rub on the back of the bird. When well covered, turn the bird breast side up and add a bit more oil, making sure the breast is well oiled. Sprinkle more rub until it's well seasoned and rub into the skin. Put the thyme into the cavity and then, with a fork, poke the lemon several times, over the chicken until it will drip a little juice onto the bird. Put the lemon in the cavity. Place skillet and bird inside the pre-heated oven. Set your timer for 1 hr. 10 minutes. Baste once at 45 minutes and once at 1 hr. When the timer goes off, check the bird. It should be golden brown and the leg should move easily. If it's ready, pull the skillet out and let it cool just a bit on the stove. Carefully move the bid to the cutting board and tent with foil. I use a sturdy spatula and tongs to move the bird, which helps me not leave any skin in the pan. Pour off as much of the fat as possible and then put the skillet over high heat. Add the wine, and scrape some of the bits off the bottom of the pan. Add the stock and bring to a simmer and reduce to a roughly four tablespoons. Meanwhile, in a large non-stick skillet, melt butter and add chopped garlic. As soon as it's just lightly browned, add the green beans and a bit of salt and pepper to taste. Toss or stir to coat and fry the beans for 1 minute, then toss again. Reduce heat to medium. Toss occasionally to brown some of the beans and to make sure all are tender. Pre-heat your plates. When your sauce has reduced (about 6 minutes) your green beans should be done. Turn the heat down on both and carve your bird. You can either sauce the plate and place the chicken on it, keeping the skin crispier, or spoon the sauce over the chicken. Next, plate the green beans, making sure to get the garlic nubblies as well as the beans. You can easily add a starch by cooking peeled new potatoes in the chicken skillet, but I usually don't bother. Serve this with a pinot noir or something that will stand up to the robust seasoning and rich-tasting sauce. Note from the missus: To warm up we cracked open a box of BOTA Box red zin. Not the best choice for the bird, but a great deal at $16/box where 1 box=4 bottles of wine!! 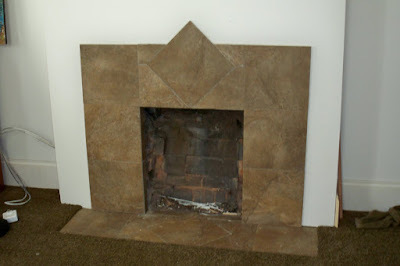 Tiling the bedroom fireplace, waiting on a mantle. 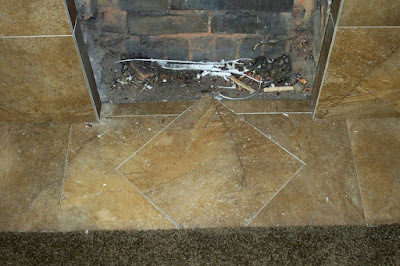 Question: How do you tile a fireplace that has a 45" threshold with 13"x13"tile? Yeah, that kindof messed with me for a while. I REALLY didn't want to do too many cuts.... after all this was just to finish up the bedroom floor so we could finish the trim. OK, yes. There is a thread on all of today's posts. IT'S ALL ABOUT THE TRIM, a.k.a, 'get it DONE and GONE' already. I'm pretty sure we'll be hosting either Thanksgiving or Christmas at our house and I'm going to be hell on heels if there's still trim in the dining room. It will not be pretty, I guarantee you. 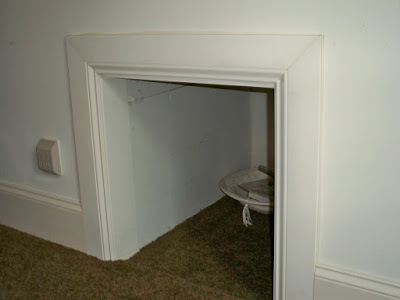 In order to finish the trim in the bedroom, we had to finish off the untrimmed drywall around the fireplace opening. No way around it. So back to bad math: 45/13 = 3.46. Almost half a tile? Now what? Somehow I was going to have to fit some combination of tiles in the space provided, which luckily was exactly 13" deep, which is how we came up with the 13" ceramic tiles left over from the master bathroom tile job. So, my brain returned to the messed up tile job I had to deal with in the Master Bath. Time to get creative. A bunch of straight cuts for small pieces were going to look goofy, and the other problem was that we barely had enough tile to do the fireplace. (Of course I thought we had a spare 8 tiles, but those disappeared somewhere.) So we had to go sparingly and not use complex cuts that might bust up the tile and waste it. I decided on using three full squares and two cut squares to fit the threshold. It seemed the only way to go about it. Also, I HAD to cut the squares and mastic them to the floor (over the existing stone concrete slab) for the base before I could attach the other tiles to the face of the wall, ans the wall piece had to sit ON the floor tiles. Two full tiles fit on the slab at the far left and right perfectly..... So I put 2 more tiles next to the outliers, then turned a center tile 45 degrees, set it on top of two center tiles and traced the tile onto the other tiles. These would be my cut marks for the cut tiles. I cut off the bottom of the center tile to fit, then put it all into place, later cutting the small 2" pieces for the left and right above the center piece. But then the problem was what to do with the top, above the opening. at an angle across the top. That quickly turned out to be a crappy idea. Turned out we barely had enough tile to finish the job, but it's done. Now we can finish the friggin' trim, RIGHT?!? 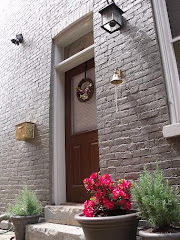 OK, it's not really a door. It's what we have been calling the 'Harry Potter' cubby underneath the living room stairs. We haven't gotten any new trim for the doors yet. I'm resisting buying any new trim for the doors (or windows or anything) until we get the rest of the floor trim up and OUT OF THE DINING ROOM. I just can't see adding to the pile in the dining room right now. I JUST couldn't take it. But I need to finish the trim in the living room, and we've already decided that the cubby is too small an architectural detail to get the 8"x5" plinth blocks the rest of the doors are going to get. So I'm gonna have to trim the cubby out some how.... Hmmm, I wonder if I can use the floor trim somehow? This time, I decided to turn the routed out (curvy) part of the trim to the inside, cut the board ends at regular 45 cuts without the funky miter cuts. In relation to the aprons and the 'castles' this part was easy. 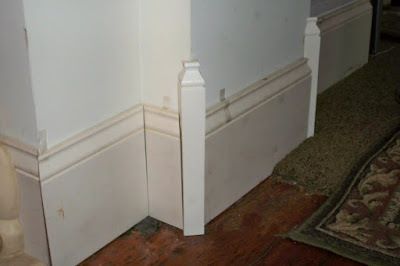 I decided to cut off 2" from the flat base of the trim along the entire length to get the final trim size. Once aI knew the final width, I could cut the final lengths. This part was a little tricky. I held the cut pieces up against the cubby hole wall and traced the outside width leaving a 1/4" reveal (gap) from the inside trim already in place. I did this for the top as well as the two sides. Where the lines intersected on the wall, I used a square to draw a diagonal line in to the inside corners. This was the template for the cuts.... as long as the top piece was level, because I guarantee you the floor is not. Once the first cuts were made (I made them 1/4" longer so I had some wiggle room) there was some jockeying about, and a third had was absolutely necessary to line everything up, space the gaps of the cut pieces to exact length. Then I painted the cut edges with at least three coats of paint to seal the edge, let them dry, then put it all together with some construction adhesive on the back (to hold the boards to the wall but allow some shifting before nailing them in place) and then whammo with the nails. Viola, fit for a magi. Yup, that's my floor trim. 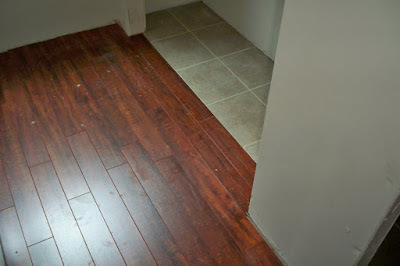 OK, this idea came out of the need to figure out how to transition the floor trim from the carpeted living room into the original wood floor in the kitchen. The height difference is about 1.5" and there was no way in hell I was about to cut an inch and a half off the bottom of all of the trim in the living room just to have smooth transition from one room to another. I thought, 'what about 2 45 degree miter cuts on the same small piece...?' and then I just started gluing things together to see what came out of it. After a few oddities of nature and carpentry, and something that looked like a small giraffe, I came up with the idea of a corner piece. For this particular transition, I needed three corners and one 'flat' piece. I wanted the corner pieces to be about 2" taller than the regular trim, (about 9.5") so I needed to make twice as many 'corner clusters' as I had corners so I could glue a bottom cluster to a top cluster and add to the height. Again, I just used the glue gun to attach the bottoms to the tops, used wood fill and sanded the pieces down until smooth before painting. 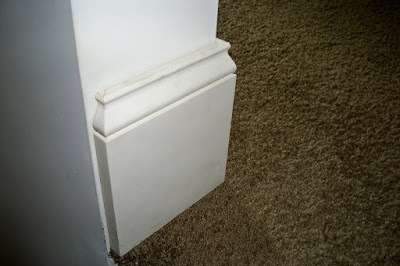 The corner pieces just fit on top of the outside corners of the wall, are about 2.5" higher than the trim, and when I stack the next piece of trim around the corner on top of the carpet, the height difference shouldn't be as obvious. DH says it looks like I made a bunch of castles for the trim. It's not done yet, so I don't have final pictures, but that's what I'm up to. 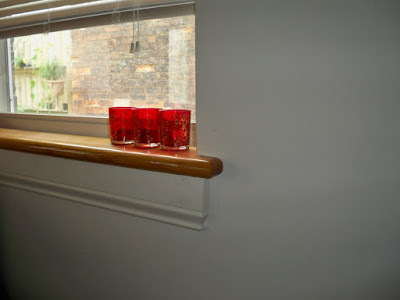 This weekend we should be taking the pre-cut trim pieces back out into the yard to spray paint with semi-gloss paint, let them dry, then bring them back inside to trim gun into the walls for final installation. These are not painted, nor nailed in place. As you can see from the pictures, there's just a few pieces of tape holding them against the wall for the purpose of taking the picture. The trim piece inbetween the two towers (heh heh, a LOTR reference in our kitchen... kewl) is scribed and cut to match the change of height in the flooring. 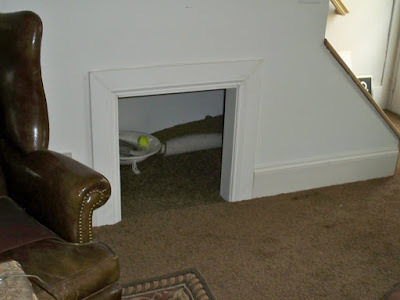 It's hidden by the carpet. The other side of the wall is a bit different. This is where I'm using the 'flat' piece mid-wall and a corner piece on the outside corner. Yeah, it needs painted too. And the towers are still not cut to the right height... they need to match the height of the ones across the door opening, which, they don't. Yeah, all the kids are doing it these days. 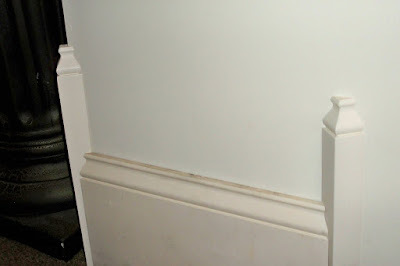 They're seeing these massive piles of 7 1/4" floor trim in 16 foot lengths piled up in the dining room, adn they say to themselves, "I wonder what else I can do with all of this trim besides put it on the floor? Like window aprons, door trims, and corner kick plates. It all starts with cutting the 45 degree angles. We had to borrow a 12" compound miter saw for the cuts because the 10" saw can only make cuts of up to 6". The first length that needs to be cut for an apron is the general length. 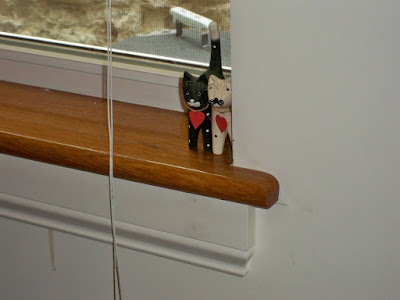 For my purposes, I measured the length of the sill, then subtracted 2" (one inch for each side). Each edge needs to be cut at a 45 degree angle, with the front (finished) surface being longer than the back surface on each side. We call these 'inside cuts'. N.B. : In communicating these cuts to DH, we started to get into trouble by not having a general terminology so we could understand each other. We decided to call a 45 degree angle cut where the back length was longer than the front an 'inside cut' (i.e. a cut for a floor board that would be in a regular corner). The apron needs two inside cuts, one on each side, and if you make the measurements and cuts very carefully, you can take the cut pieces for the mitered ends for the opposite ends. In the pictures below, I just made the cuts off of spare pieces, because, frankly, I wasn't too good at getting the exact angle at first, so I made a lot of extra cuts in order to get it right. To make miter cuts, I use a razor blade to mark the exact angle measurement, lining up the blade edge with the back corner. Then I used a carpenter's square to line up the marked angle, and scored a line down the front. This would be the line I needed to cut off to get he end piece, just barely leaving the cut line visible on the saw. When you make the cuts off of a spare piece of trim, you need a left and a right for each window sill apron. If you can cut the miters off of of both sides of a straight cut board with enough accuracy, you can use the piece you cut off of the left side to attach to the right, and vice-versa. And then my new best friend.... the glue gun. Attach the end pieces with a length of glue from a glue gun... and be quick about it or it will set up on you and you won't be able to make any adjustments. I highly recommend practicing gluing your boards together, because you will only have about 3 seconds until the glue sets permanently if you use MDF. A small gap between the two angles didn't matter much. I took the round handle of a screwdriver and rubbed it back and forth along the sharp edge to 'roll' the edges inward a bit, and then would fill any leftover gap with caulk if necessary, and then the paint would cover the rest. Once I had all six aprons cut and glued, I then use my circular saw to cut the height down to fit under neath the window sill, upside down. In about 30 minutes, I'll upload the final pictures, but in the meantime, the batteries are kaput., and it's attached to a charger.